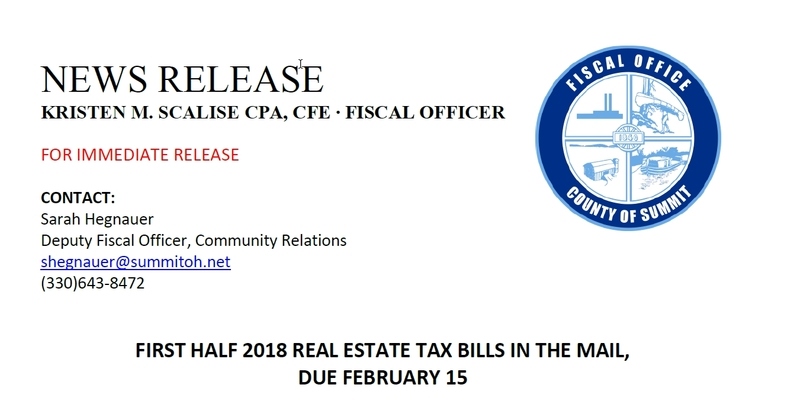 On behalf of Summit County Fiscal Officer Kristen M. Scalise CPA, CFE, please see the attached news release announcing that first half 2018 real estate tax bills will be mailed beginning Friday, January 18, 2019. The closing date for payment will be Friday, February 15, 2019, with the exception of military personnel. Property taxes are deferred for military reservists who are on active duty. Please feel free to contact me if you have any questions. Have a great day! Akron, Ohio, January 16, 2019 – Summit County Fiscal Officer Kristen M. Scalise CPA, CFE has announced that first half 2018 real estate tax bills will be mailed beginning Friday, January 18, 2019. The closing date for payment will be Friday, February 15, 2019, with the exception of military personnel. Property taxes are deferred for military reservists who are on active duty. Applications can be obtained by calling 330-643-2641 or visiting our website at http://fiscaloffice.summitoh.net. provides guaranteed same-day transactions. A nominal service fee will be charged by Official Payments Corporation. To locate a MoneyGram center, visit www.OfficialPayments.com/locate or call 1-800-MoneyGram. The original document provided by Summit County can be obtained below.Download here.